As much as we love to push the limits on weekend trips, we do this in order to save vacation days for two to three actual vacations per year (i.e. a trip that’s at least a week). Our first “real” vacation in 2016 was to Greece for the 4th of July. 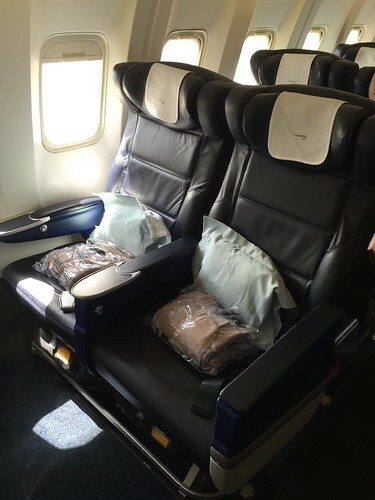 In a previous post we detailed British Airways’ amazing business class sales. 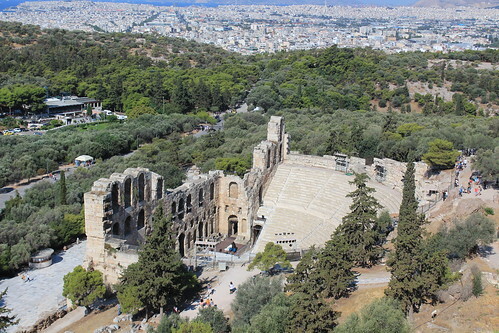 Since the deals were so good we booked two fares as part of that deal – London/Milan Memorial Day and a flight to Athens. 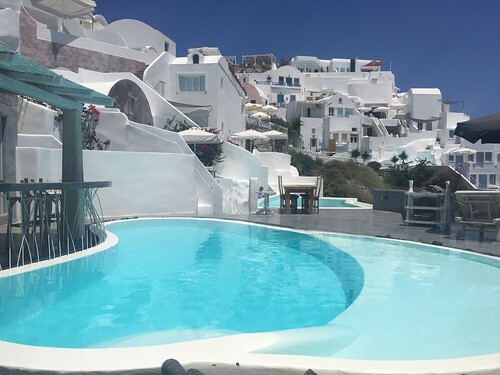 We didn’t set out to plan a trip to Greece specifically (though it was certainly on our list) but to get good deals it’s important to be flexible on both time and location. Our flight to Athens (ATH) on BA wasn’t nearly as good of a deal as previously but still $2,026 RT is really solid for transatlantic business class, especially given that all flights were AA codeshares. In fact, at the time of booking, an economy round trip from SFO to ATH was $1800! Our itinerary had us on BA’s earlier SFO-LHR flight leaving at 4pm on Friday, July 1st. 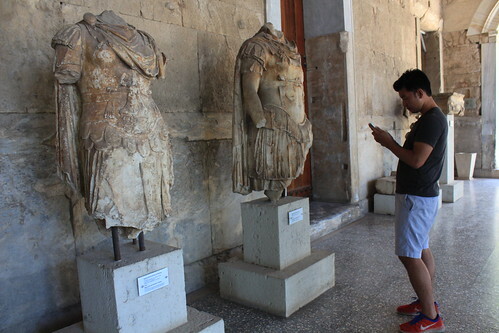 We had a quick layover before arriving in ATH on Saturday evening. The return ATH-LHR-SFO departed and arrived back on Sunday, July 11th. On the outbound from SFO-LHR we decided to try a different seat configuration, with Sarah on the outside and David on the inside. 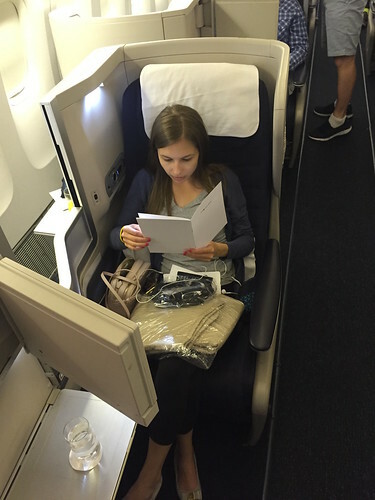 Sarah’s seat is most dreaded of BA business class – perhaps even one of the most dreaded international business seats on any airline. You are extremely exposed with very limited privacy, though an advantage of this seat for couples is that you don’t have to stare at a stranger when the divider is down. 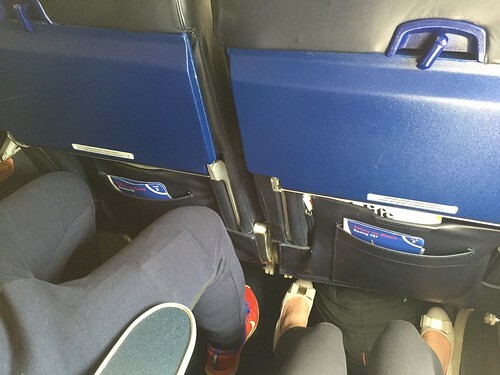 Additionally, you have direct aisle access without having to climb over anyone’s feet/footrest. Bottom line: the outer seats aren’t terrible for couples but we still prefer the middle. For the LHR-ATH connection, we were pleasantly surprised to be on an older BA plane so that we could have a two-seater versus a three-seater for the three hour flight. Legroom was a bit better than the newer Club World seats but still very cramped (depending on your height ). The next time you complain about flying domestically in the US, just be happy that you aren’t flying intra-Europe. After consulting friends, travel guides, etc. 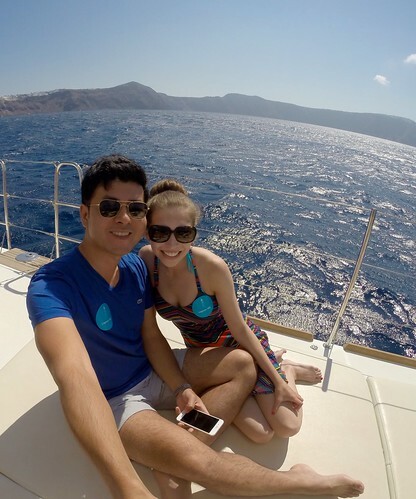 we decided to split our trip between Athens and the island of Santorini. 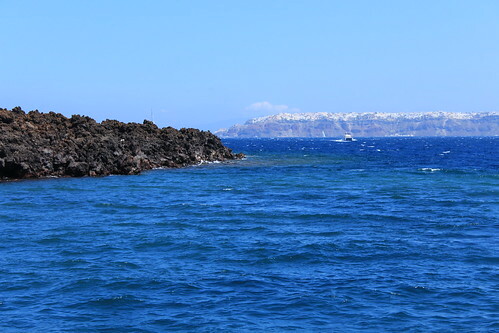 This meant that we’d be purchasing a separate round trip from ATH to Santorini (JTR), which brings us to one of the most unavoidably expensive parts of international travel: regional short haul flights. 100% of people strongly said to avoid Ryanair so we immediately excluded that option along with Volotea, another regional airline. That left us with Greece’s national airline: Aegean. Each round trip was $245 which is an awful CPM to go 272 round trip miles but you can’t win them all. Surprisingly, Aegean was a great experience with lots of legroom and quality snacks despite the 30 minute flight. We’d take this any day over BA Club Europe. During this trip, we learned that BA has a direct flight from LHR-JTR which would have saved us about five hours in travel time – for a future trip we’d prioritize this option. Generally when traveling to Europe, we opt to stay in Airbnbs over hotels for a two main reasons. First, we enjoy the idea of actually “living” in a particular city. 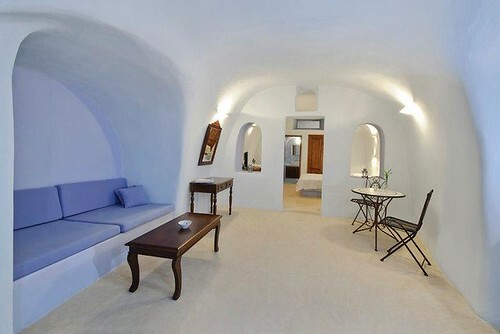 Secondly, you can get a lot more space (kitchen, living room) compared to Europe’s notoriously small hotel rooms. 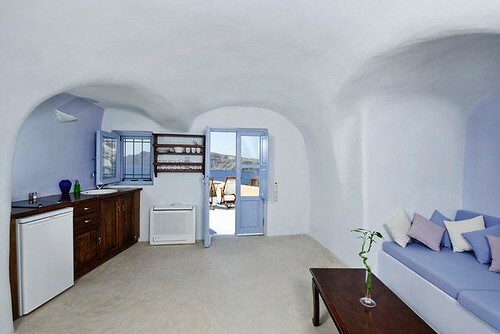 Overwhelmingly, we had been happy with our Airbnb choices but Santorini was one exception. We underestimated the amount of time we’d be spending in the room due to the need to spend the hours of 3-7pm inside because of sweltering heat. And speaking of sweltering heat, we also failed to consider that our lack of a pool was a major issue (hot tubs aren’t very additive when it’s 95 degrees). On the plus side, we did locate the hotel (pool) we’d like to stay at for a future visit! Our conclusion is that for heavy sightseeing cities where you’re out all day like London, Paris and Dublin, Airbnbs are the way to go. However, for cities that are more laid back and focused on relaxation, there are certain luxuries that only hotels can provide. 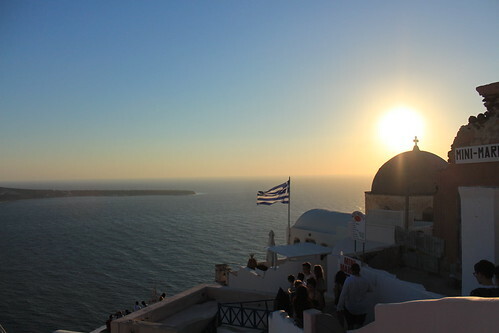 Santorini itself, and specifically the town of Oia, was amazing and definitely on our list of places to return. It is truly is beautiful and easy to see why it’s one of Europe’s top islands to visit. 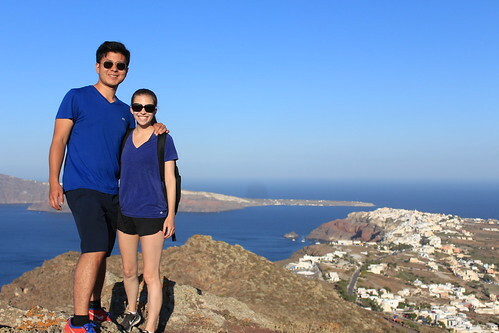 Additionally, it’s a great place to get fit because Santorini has A LOT of stairs – our Airbnb was 123 steps down the caldera! Some of our favorite moments were sailing around the island, going for a 6am sunrise hike, and watching the incredible sunset each evening. We left Santorini mid-day to fly to Athens for a 2.5 day stay. 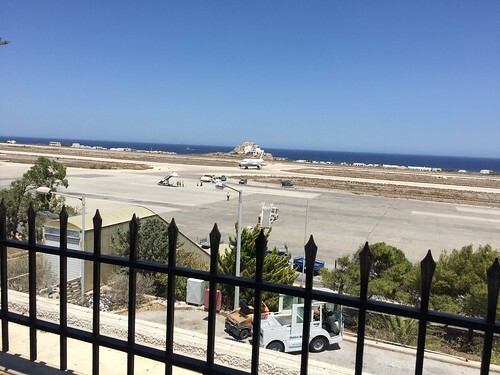 Santorini’s JTR airport probably wins the award for our worst airport experience globally: extremely small, dirty, and lounge-less. We mistakenly arrived 2.5 hours prior to departure when we probably only need 30 minutes. 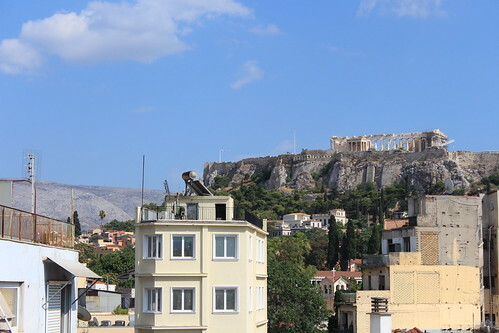 Onward to Athens, we were hoping that our lodging (in this case, a hotel) wouldn’t be another disappointment. Boutique hotels are really a hit or miss as it’s great to stay at a place that feels more local but the brand consistency that you get staying at a W or Andaz is lacking. 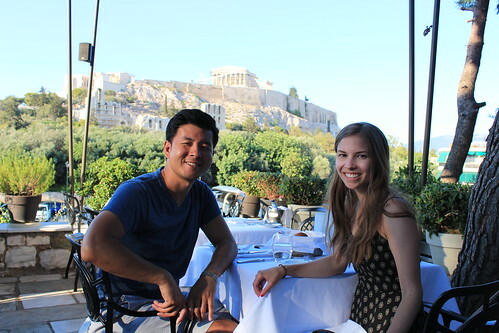 After roughing it in our Airbnb Oia cave, our stay at the O&B Athens Boutique Hotel was a delight with the best part being our gigantic patio complete with a view of the Acropolis. 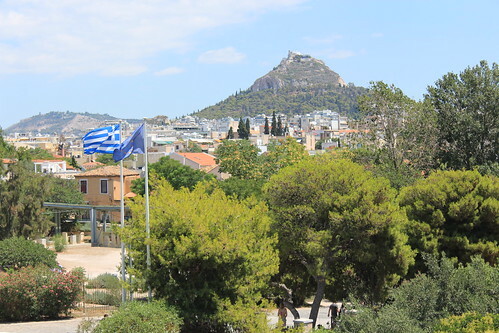 Overall, we agreed with the general sentiment that Athens can easily be seen in 2-3 days. While we enjoyed our stay, it’s not someplace we feel a huge need to return to in the short term. One of the highlights was the Acropolis Museum along with the numerous restaurants that provided an amazing view of the Acropolis. 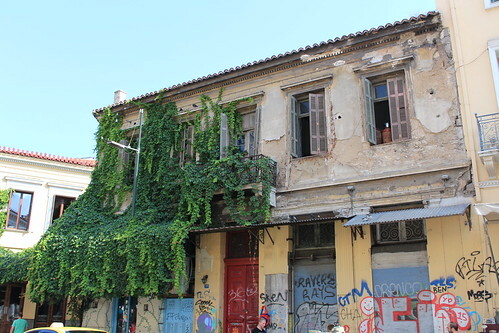 Another pro is that Athens was extremely walkable – the only time we needed to take a taxi was to and from the airport. 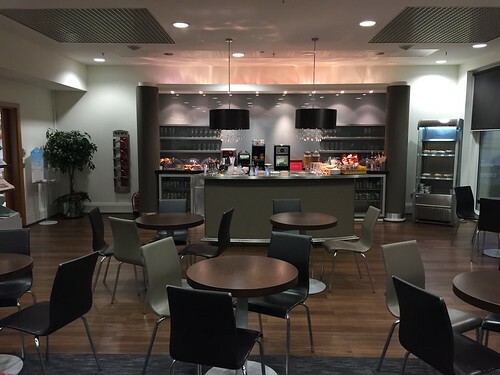 We cleared customs very quickly for our morning flight out of ATH and waited at the door for the BA lounge to open. 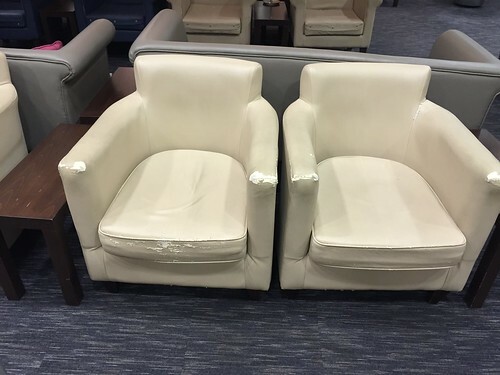 This lounge has definitely seen better days as evidenced by extreme wear and tear on the chairs. 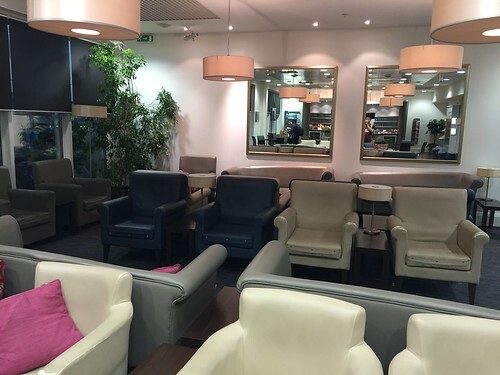 Unfortunately most BA lounges leave a lot to be desired, except for the LHR lounges which are amazing. 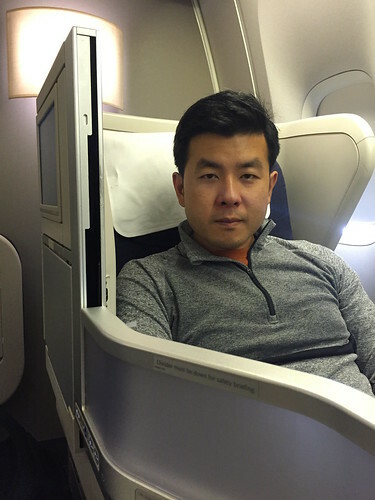 This now concludes the summer of BA business class and our last international flight under AA’s current mileage earning system, where you earn redeemable miles based on the distance of the flight along with a bonus for your status. It’s been a good run the last couple years but come August 1st 2016, the party’s over. AA has changed their loyalty program to mimic United and Delta, where mileage will be awarded based on the price of the ticket regardless of the amount of miles flown. (e.g. Under the new structure a $500 flight from SFO-DFW and $500 flight from SFO-HKG would earn the same amount of redeemable miles.) The good news is that we’ll both be re-qualifying for Executive Platinum this year but our future after February 2018 is still uncertain. Stay tuned for upcoming posts as we navigate what these changes mean for our mileage running habits. Awesome! 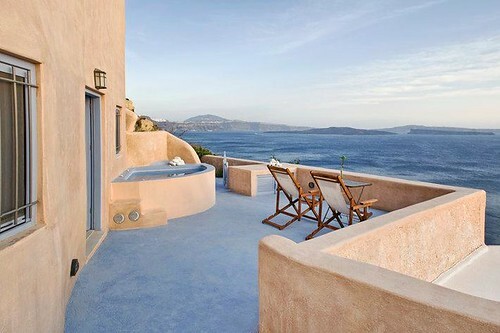 Would you recommend 2 weeks in Greece or would that be too long? We’ve had Business tickets on AF, non-refundable but are losing interest. Trip isn’t until late September. Hi Dakota – We did eight nights total but I could see spending two weeks in Greece if you visit a couple different islands.